We are overwhelmed. Too many ideas, too much information. We all suffer from our demanding modern lives. We need to be faster, better and have all the answers to everything. Idea Mapping is an analog solution to creating order in our lives. What is Idea Mapping? The very basic idea of idea/mind maps is that you can clearly organize data and information in a way which is brain compatible. It's just a new turn on how to do mind maps. I'll be using idea mapping and mind mapping interchangeably during this article. "Mindmap(s)" is term supposedly coined by Tony Buzan a "memory and creativity" specialist. It's a way to direct your mental productivity. I've personally found Mind Maps useful as an alternative to creating outlines. Mind Maps which contain colours are great to summarize a speech, lesson, presentation, or books read. I'm starting from the reality that there are multiple types of intelligence and ways to understand the world. We should call these "perceptions". The old school way of "thinking" is the linear thinking we've been accustomed too. This is a fairly unnatural way of learning. No wonder that children have been labeled as having attention deficit and some haven't been able to advance educationally in the world. We learn by creating associations! People learn by combining all of our senses visual, Audio, Kinesthetic, smells, tastes. Mind Mapping is a way to visually structure and understand the world based on visually organizing it. A Mind Map is a visual representation of associations. My mind map will be different than yours yet both of our maps will be much better than linear notes. Thousands of studies show that people remember around 10% of what they hear, 20% of what they read and around 70% to 80% of what they see and do. Thus being creative by focusing energy on doing something visually appealing is what will give us all the interconnections between key points. Internalizing the information fairly easily. Mind-mapping is a more organized and simplified way to take notes. Most people whenever taking notes tend to focus too much on capturing everything. While it's better to define a purpose for taking notes and simplify the process. I remember back in high school we had a replacement history teacher who used to urge us to write the minimum amount of necessary information. Summarize a page with just a few words. This way we'd be able to summarize a whole book in just a few pages. Which in turn will be easier for us to learn when preparing for exams. This process only later became apparent when I started reading about mind mapping. How does a Mind and idea Map look like? Here's a powerful visual example of a Mind Map done RIGHT. 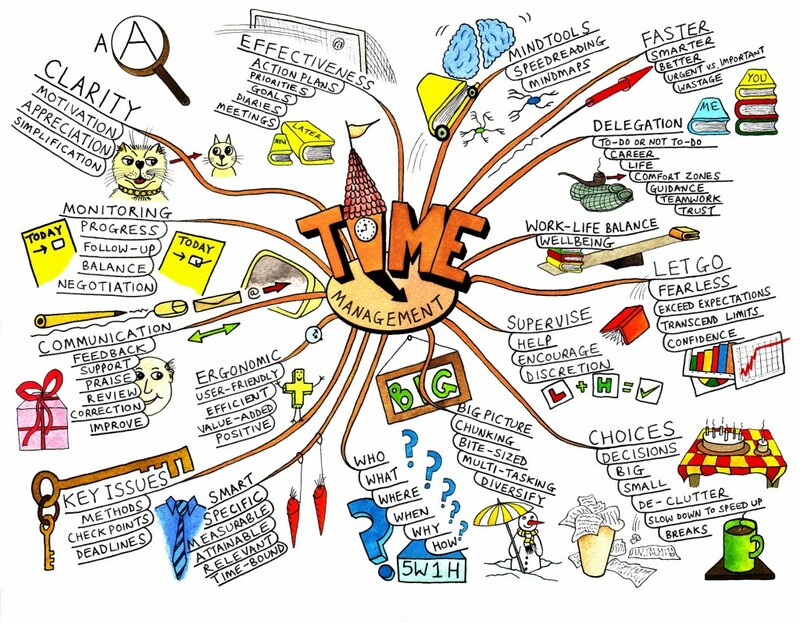 There is a central idea, in this case, "TIME MANAGEMENT". It's positioned the center of the page. Then there are all kinds of branches going out from it. Most of the time you'd write a topic name on a branch. Each subbranch contains further clarifying information. Notice that mind maps use a one-word summary for each branch, subbranch or leaf. This is intentional. As you'll force yourself to summarize the important point in one word. This will help retention since you're actively thinking about it. Then notice all the drawings. Most mind maps don't have too many drawings. This is OK. yet this one is attractive. How does Mind mapping or Idea Mapping work? Most of the time we have a bloom of ideas related to a topic. This means we should write the topic in the center and then link it to all the other related ideas. However sometimes one idea associates to another idea and so on, this is called a flow of ideas. Since our mind is associative we can combine both the bloom and flow of ideas into a... MINDMAP! Wherever your brain goes there's where you also need to go. Don't worry about making a mind map perfect. You can always create a version 2 later. Right now just capturing your ideas is essential. Order comes later. All great writers start writing what they have on their minds. The magic of their writing comes through on a later day through the editing process. The same holds true for mind mapping. Identifying the important keywords is essential. Nearly 90% of any text is comprised of non-essential words (like at, and, in, a, was, the, or, etc). By focusing on one keyword you can then summarize the essential in your own words. Identify the main branches from all of the ideas. Adding simple graphics and icons is the next step. You don't need to be an artist to be able to draw simple icons. Adding your own images with your own chosen keywords will create a longer lasting idea/image. It's going to be clear what idea you're trying to convey. One idea I've loved from the whole Idea/ Mind mapping is the fact that you can create a mind map while you're actually learning or in the midst of a presentation. This way you'll have a clear overview of the presentation before you even get to the end of it. Real-Time mapping is difficult at the beginning if you haven't had experience with mind mapping. But once you get going you'll enjoy the power it provides in organizing relevant information. You can mindmap almost anything! Sometimes you might want to create mind and idea maps digitally. The book recommends the "Mindjet" software. I've used various software apps for mind mapping. I'm not going to recommend any and I'll explain why shortly. Just search for "online mind map software" and see what fits your expectations. There are certain benefits as easy back-ups. Easy integration of data, images, etc. However, there is ONE drawback. You can lose tons of time on using software for mind mapping as it will NEVER be as flexible as writing something on paper. This is why I mostly create mindmaps on paper even though my handwriting isn't the most appealing. Mind (and idea) mapping is highly useful in our daily lives. As it provides a way for us to organize our thoughts and information in a nonlinear way. This book is very easy to read. it provides tons of advice and ways to dive into mind mapping. Its diversity of combining text and idea maps makes it easy to grasp how to actually do an idea map. At the end of each chapter, you'll have a short "mind/idea map" summary. The Idea Mapping book provides far more examples of how to create powerful and compelling mindmaps. It's full with detailed steps on how to start and which pitfalls to avoid. It's clear that the writer has been using them for years and has trained numerous people on the subject. Start using mind maps and organize your thoughts!